This year, more than five million entrepreneurs will launch a new venture. Many of them believe they have the Next Big Thing. But very few startups live to see five years, and even fewer make it to ten. Even fewer still go on to become a global success stories. This book is a practical guide to evaluating your business idea and a must-read for all aspiring entrepreneurs. 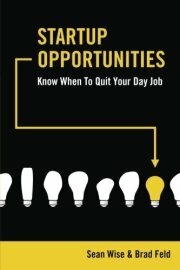 By reading Startup Opportunities, you’ll learn: – that if your new venture doesn’t follow the 10x Rule, you should not quit your day job and why – how early customer development can transform a good idea into a great opportunity – which opportunities are worth selling everything for Brad Feld and Dr. Sean Wise have been assessing startup opportunities for more than two decades. They have witnessed more than 30,000 pitches and participated in more than 500 startup launches. Now two of North America’s leading minds in venture capital share how they determine which startups will succeed and which will fail. 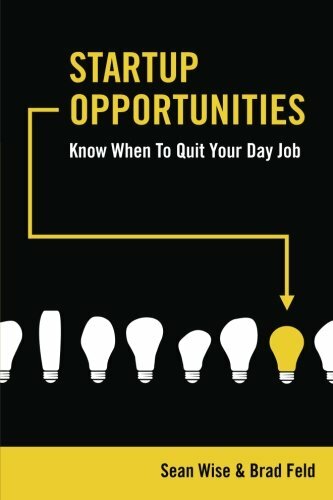 This book is indispensable for anybody who has ever thought about starting a business or fumbled their way through giving advice about starting a business.